Papaya is a famous fruit from tropical region. Its flesh is red or orange but also yellow. Most people eat papaya when it is riped. 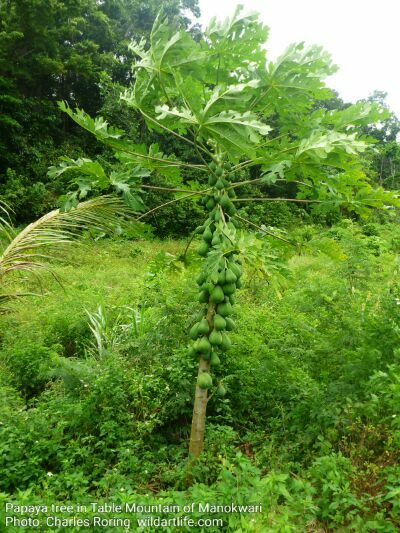 However, in many people in New Guinea grate unriped/ green papaya and cook it as vegetables. People in North Celebes province of Indonesia half ripe papaya fruits to make gohu (pickles). The main ingredients of gohu pickles are papaya that have been cut into small bite size fruits, cool water, chilli, vinegar, salt, red onion, and some sugar. Papaya flowers are mixed with kangkung (water spinach) and are stir fried as vegetables. It is a favorite vegetables among eastern Indonesian people.